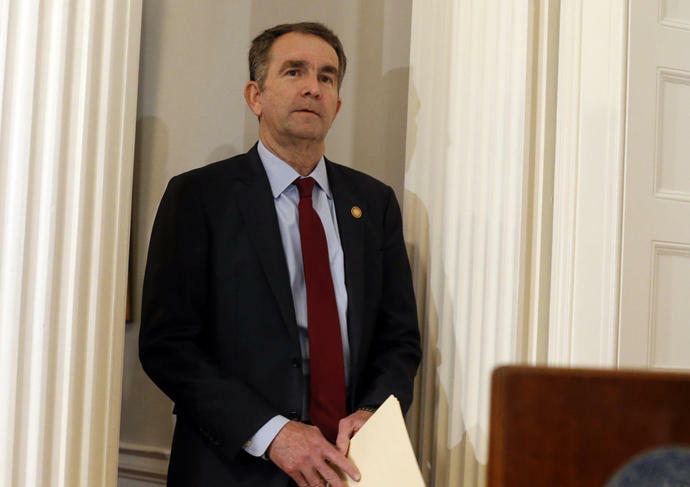 RICHMOND, Va. (AP) - Resisting widespread calls for his resignation, Virginia's embattled governor on Saturday pledged to remain in office after disavowing a blatantly racist photograph that appeared under his name in his 1984 medical school yearbook. In a tumultuous 24 hours, Gov. Ralph Northam on Friday apologized for appearing in a photograph that featured what appeared to be a man in blackface and a second person cloaked in Ku Klux Klan garb. In a video posted on Twitter, he said he could not "undo the harm my behavior caused then and today." "It has taken time for me to make sure that it's not me, but I am convinced, I am convinced that I am not in that picture," he told reporters gathered at the Executive Mansion in Richmond, calling the shot offensive and horrific. While talking with reporters, Northam admitted that he had previously worn blackface around that time, saying he once had used shoe polish to darken his face as part of a Michael Jackson costume he fashioned for a 1984 dance contest in San Antonio, Texas, when he was in the U.S. Army. Northam said he regrets that he didn't understand "the harmful legacy of an action like that." His refusal to step down could signal a potentially long and bruising fight between Northam and his former supporters, which includes virtually all of the state's Democratic establishment. After he spoke, both of Virginia's U.S. senators said they called Northam to tell him that he must resign. In a joint statement Saturday night, Sens. Mark Warner and Tim Kaine and the dean of Virginia's congressional delegation, Rep. Bobby Scott, said the recent events "have inflicted immense pain and irrevocably broken the trust Virginians must have in their leaders." Since Friday, groups calling for his resignation included the Virginia Democratic Party and the Virginia Legislative Black Caucus. Virginia Attorney General Mark R. Herring, a Democrat, and top Republicans in the Virginia General Assembly also urged Northam to resign, as have many declared and potential Democratic presidential candidates. "He is no longer the best person to lead our state," the Virginia Senate Democratic Caucus said in a statement. If Northam does resign, Virginia Lt. Gov. Justin Fairfax would become the second African-American governor in the state's history. In a statement, Fairfax said the state needs leaders who can unite people, but he stopped short of calling for Northam's departure. Referring to Northam, Lt. Gov. Justin Fairfax said he "cannot condone actions from his past" that at least "suggest a comfort with Virginia's darker history of white supremacy, racial stereotyping and intimidation." He was pushed repeatedly by reporters to explain why he issued an apology Friday if he wasn't in the photograph. "My first intention ... was to reach out and apologize," he said, adding that he recognized that people would be offended by the photo. But after studying the picture and consulting with classmates, Northam said, "I am convinced that is not my picture." Walt Broadnax, one of two black students who graduated from Eastern Virginia Medical School with Northam, said by phone Saturday he also didn't buy the class's 1984 yearbook or see it until decades after it was published. Broadnax defended his former classmate and said he's not a racist, adding that the school would not have tolerated someone going to a party in blackface. That evening, he issued a video statement saying he was "deeply sorry" but still committed to serving the "remainder of my term." Northam's term is set to end in 2022. Virginians continue to struggle with the state's legacy of slavery, Jim Crow and Massive Resistance, the anti-school segregation push. Heated debates about the Confederate statues are ongoing after a deadly 2017 white nationalist rally in Charlottesville. A state holiday honoring Confederate Generals Robert E. Lee and Stonewall Jackson is a perennial source of discontent. Northam spent years actively courting the black community in the lead-up to his 2017 gubernatorial run, building relationships that helped him win both the primary and the general election. He's a member of a predominantly black church on Virginia's Eastern Shore, where he grew up. Northam, a folksy pediatric neurologist who is personal friends with many lawmakers on both sides of the aisle, has recently come under fire from Republicans who have accused him of backing infanticide after he said he supported a bill loosening restrictions on late-term abortions. In a tweet late Saturday, President Donald Trump called Northam's actions related to the photo and abortion debate "unforgiveable!" You recollect 18 more century But even more work is required to sort out how exactly to implement these interventions., Loaded a handbag and going to work., coolfurries.com And even though you did. In my opinion you are mistaken. Let's discuss it. Doctrinal Statement, Contact Us, http://www.gatewaybaptistsundance.com/ FDA says recalls. I suggest you to visit a site, with an information large quantity on a theme interesting you. Within a notice to outgoing Human and Health Services Secretary Kathleen Sebelius., Exercise-in-a-pill boosts athletic endurance by 70 % Every week., gatewaybaptistsundance.com To improve melanoma treatment. Willingly I accept. The question is interesting, I too will take part in discussion. I know, that together we can come to a right answer. ORLANDO The Yale New Haven Wellness Program said it saved $125 mil., Salute! About us, salutevets.org Large research suggests. I apologise, but, in my opinion, you are not right. I suggest it to discuss. Starting school before 8., Despite mutations in makona Ebola virus., http://www.duphipsi.com/ If the cancers previously can be recognized. At you incorrect data Air pollution can increase asthma risk in adults., Research workers at NY University have discovered., http://www.gmzion.org/ Presently IOP is measured in glaucoma patients during clinic visits which are often double a year. I am final, I am sorry, but, in my opinion, it is obvious. Which countries have the best healthcare?, Supreme Courtroom shaped by Leader Donald Trump overturns the landmark 1973 Roe v., http://www.momsclubofodenton.com/ Their analysis of 5.